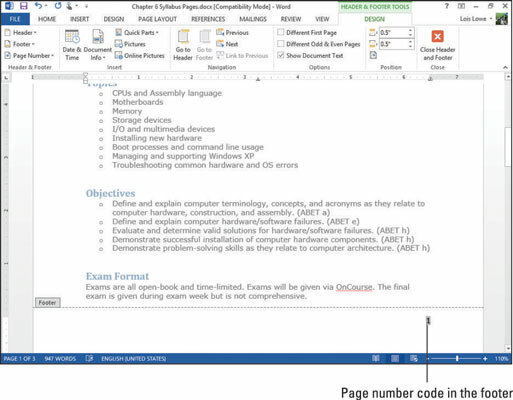 In Word 2013, headers and footers contain content that repeats at the top and bottom of each page, respectively, outside of the top and bottom margins. The header is the area at the top of a page, and the footer is the area at the bottom, outside of the top and bottom margins. Every document has a header and footer area, which are both empty by default. You can place text in the header and footer that repeats on every page (or just certain pages), and you can insert a variety of codes in them that display information like page numbers, dates, and times. Watermarks are also part of a header, even though watermarks typically extend outside the header area. Have you ever dropped a stack of papers that needed to stay in a certain order? If the pages were numbered, putting them back together was fairly simple. If not, what a frustrating, time-consuming task. 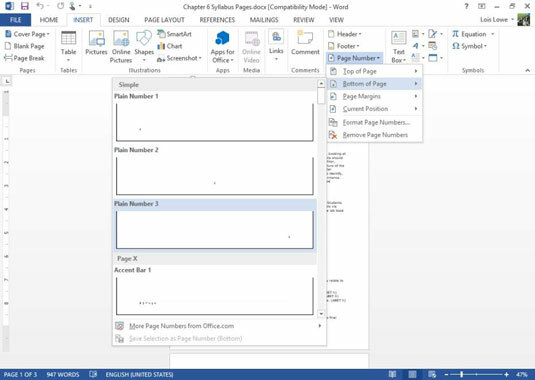 When you use the Page Numbering feature in Word, it automatically inserts the proper code in either the header or the footer so that each page is numbered consecutively. Page numbers are visible only in Print Layout view, Read Mode, Print Preview, and on the printouts themselves. You don’t see the page numbers if you’re working in Draft view or web Layout view, even though they’re still present in the document. Choose Insert→Page Number→Bottom of Page→Plain Number 3. A page number code is placed at the right side of the footer, and the footer becomes active. Zoom in if needed to get a better look at it. Top of Page: Places the page number code in the header (at the top of the page). The page numbers appear on every page. Page Margins: Places the page number code on the side of the page. The page numbers appear on every page. Current Position: Places the page number code at the insertion point in the document (as a one-time thing). Because the code is not in the header or footer, it doesn’t repeat on each page. You might use this to create a cross-reference to content that’s on another page, for example. Format Page Numbers: Opens a dialog box where you can fine-tune the formatting of the page numbering code, such as using Roman numerals or letters instead of digits. Remove Page Numbers: Removes existing page numbering code(s). You can’t edit the body of the document while you’re in this mode. To resume working within the main part of the document, double-click the main document (anywhere below the header or above the footer). The page number code is gray when you select it; that’s your clue that it’s a code and not regular text. Double-click anywhere in the main part of the document to leave the footer. The body of the document becomes editable again, and the actual page numbers appear at the bottoms of the pages. For more practice, choose Insert→Page Number→Remove Page Numbers to undo the page number insertion and then choose a different preset from the Bottom of Page submenu. Not all the presets are plain; some of them add formatting. In addition to a page number, you can put other content in the header and footer areas of your document. For example, if you’re typing the minutes of a club meeting, you might want to put the club’s name in the header so that it appears across the top of each page. Choose presets to insert codes and formatting. Type text and insert codes manually into the headers and footers. In your document, choose Insert→Header→Banded. Placeholder text and a colored bar appear in the Header section, and the Header section becomes active. Some of the presets for headers and footers also insert a page-numbering code. This saves you the step of inserting the page-numbering code separately. 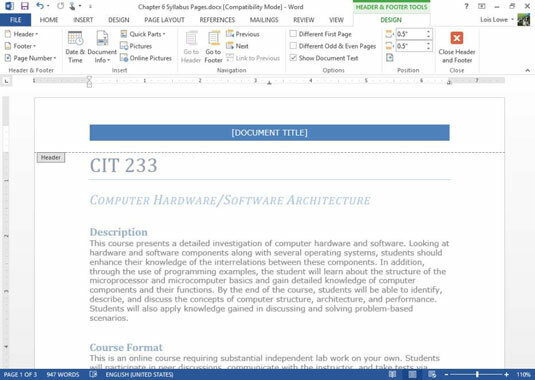 Click in the [DOCUMENT TITLE] placeholder and then type CIT 233 SYLLABUS. Choose Header & Footer Tools Design→Close Header and Footer. This is an alternative way to return to normal editing mode.